Also known as agarwood, aloeswood and jinkoh, oud is Nature’s most exquisite fragrant offering. 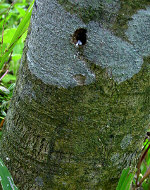 Deep in a Far Eastern jungle, an evergreen tree is attacked by fungus-carrying insects that bore into the tree. Much like our bodies’ immune system produces white blood cells, the tree starts producing a substance to combat the infection. Over the years, the infection grows – as does the substance the tree produces. This is agarwood. Indigenous cultures and modern minds alike swear to the sacred nature of this mysterious tree. Oud has a place in the homes of laymen to business tycoons, whether as carved religious symbols, or bottles of fragrant oil. ‘We’ve lost our minds, and our sense of time,’ Ensar said, shaking his head. Sunrise was minutes away, yet we felt like it was still midnight! We’d just spent the best part of the night engulfed in the smoke of burning oud chips, talking about how spacey our minds had become. ‘Boy, the mental … incredible,’ Ensar muttered to himself as the burner was sizzling up the last chip for the night. As for relieving stress, there’s no doubt. But all those anecdotes about meditating monks and samurai warriors swearing by the ‘power’ of agarwood incense suddenly became more than just ancient references to something most of us never really take too seriously. It was clear that these bubbling oud nuggets on the burner had everything to do with a certain mood we found ourselves in; making you more receptive to certain thoughts and emotions. We were fascinated by how the peculiar frame of mind made us appreciate, as if for the first time, the part agarwood plays in meditation rituals. From applying a swipe to save face on an nerve-wrecking plane-ride through thunder clouds, to chewing a bite-sized piece to help clear away an aching throat, we’ve encountered our fair share of strange moments – moments where the mystery associated with this fragrant tree have not seemed that far-fetched. Not far-fetched at all. Ancient wisdom taught of the profound unity of the corporal, spiritual, and experiential dimensions of Humankind. From Tibetan monks to Japanese Shamans, from agnostic new-age Spirituality to orthodox Sufism, agarwood possesses a salient mystery honoured by traditional cultures wherever it was found. Being an earthly element, agarwood has a quality that grounds our primordial being, with its medicinal and therapeutic properties well recognized by all who have spent some time exploring its intricacies. Yet, oud is recognized for more than just its healing qualities. It has a very real spiritual pull, no doubt. But it also just smells incredible. This entry was posted in Uncategorized and tagged borneo, oud. Bookmark the permalink.